By The Frock Flicks Team on July 24, 2018 in Tangential but Interesting! 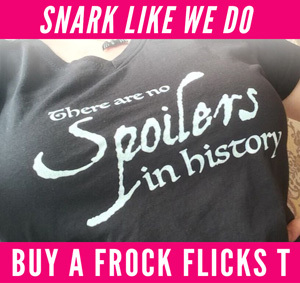 The Frock Flicks team spends a lot of time working through our backlogs on Netflix, Amazon Prime, Hulu, BritBox, Acorn, and broadcast cable to watch historical costume movies and TV shows. We’ll even go out to a theater to see a movie some days. Alas, not every flick set in the past is worth our time (though check our our archives of reviews by using the search box!). 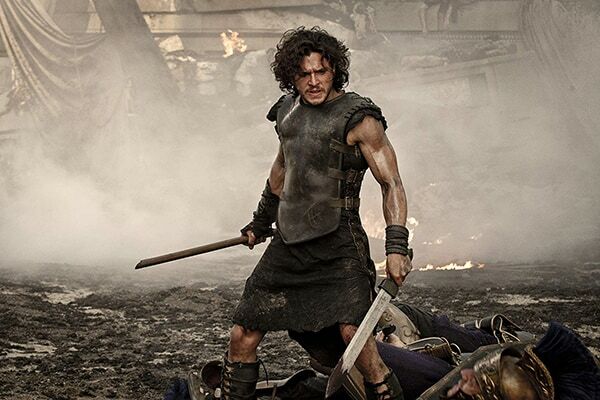 We gotta tell ya: There are a lot of crappy historical costume movies and TV shows out there! Not everything’s bad enough for Snark Week — some are just weak tea. These are boring movies, the dull shows, the ones with mediocre costumes and stories that can’t even rise up to the level of camp entertainment. Or the ones that are mildly entertaining, maybe have ‘good-enough’ costuming, or are moderately snark-worthy, but we can’t be arsed to work up a sweat about it. Thus, here’s a continuing series with our one-line reviews of things we’ve tried to watch but just don’t care enough about to write a whole blog post or podcast. Your mileage may vary! Do you love one of these historical costume movies or TV shows? What else should we remove from our queue? Have you searched our site recently to see if we’ve already reviewed your faves? The Little Hours is not just obscene, hilarious and historical, the plot is heavily drawn from Boccaccio. And the director is a Medieval Lit PhD. I loved the film — apparently most of the dialogue was improvised by the actors. I’m glad that I ended up watching it at home. I haven’t laughed that hard in a long time, but I think I’d rather not have seen it with other people around, especially the stupid ones who bring kids to a (very) R movie. I was pleasantly surprised by how much I enjoyed the music. There were a number of complex choral pieces – monastic chant isn’t that exciting. I also appreciated that plot went somewhat into the consequences of dowries and “donations” to the church. Monastic history is my jive. The donkey may be the smartest character. Oh, come ON, Pompeii is so hideously bad that it’s Perfect Of Its Kind! If you take a slug of your favorite hootch each time there’s a looong meaningfulllll pan over Vesuvius, you’ll be flat on the floor 20 minutes in. It is possibly the silliest movie ever made that wasn’t actually done by the “Carry On” crowd. Hahahaha – maybe I didn’t drink enough? Please review the new Poldark series! now that the dresses are decidedly getting more regent/empire line i’d love to know how accurate they are. and the hair! We’ve reviewed each season after it airs in the U.S. — search the site! I’m assuming that by “series” they literally mean the most recent season (series in the Brit sense) currently airing in the U.K. In which case I think it airs in October here. Yes, if it’s currently airing in the U.K., it won’t air in the U.S. for several months, & we probably won’t review it for a while after that. I stumbled across Amazon Prime’s costume shows recently. “To Walk Invisible” is a two-episode series about the Bronte siblings. It leans so hard into drama it’s almost comical. When I saw Prime also had the movie “Leonie,” I was thrilled. It’s a biopic about Leonie Gilmour, mother of the artist Isamu Noguchi. Her story is awesome and isn’t told enough. * I don’t remember what the costumes were like, and the film suffers towards the end as the director was forced to remove 30 minutes of the movie, a process she likened to cutting her flesh. 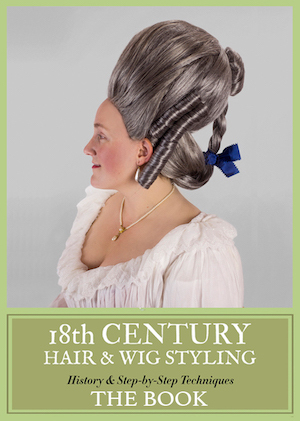 Still highly recommended, though not for the outfits. *White woman who openly raises her mixed race child from 1904 onward, never passing him off as a nephew or herself as a widow. She moves from the US to Japan despite not knowing the language and that country also looking down on unmarried women with illegitimate children. I liked To Walk Invisible overall (minor quibbles about biographical accuracy, as always) & reviewed it when it first aired on PBS (search the site!). Leonie has been on my watch list for a while. 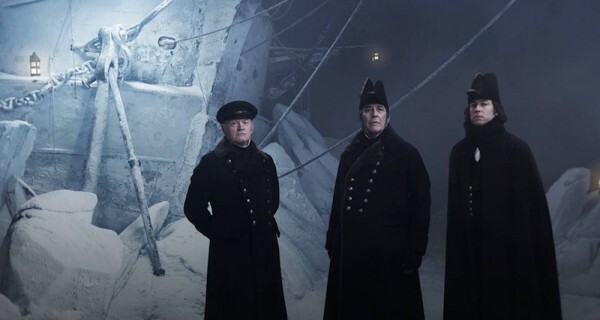 The Terror was excellent in their historical accuracy. The acting was superb all around. The one thing I quibbled with was it was one episode (aka one hour) too long. I did not need to see the endless trudging to ‘get’ the point that the expedition was going to reach a tragic end. I mean, it’s sort of in the set up of the show and the show’s description, “The doomed Franklin Expedition.” The first episode was two hours, the rest were one, so when we got to the 1:20 long episode # 9, I thought, this is it. Then at the end of the episode, I knew that we were not dead yet (to pun on Monty Python). I’m also wondering since I read your rant on the series, how you feel about the Alienist garnering an Emmy nod for Best Limited Series? I for one was miffed because it was cliched and I agreed with your rant on it a few months back. I’m also more than miffed that such a terrible disgrace of a Limited Series would win a nod when Quality such as the Terror and (not period but I LOVE IT SO) Twin Peaks: the Return would not get the Best Limited Series nod! The Emmy nominations (also Oscars) is as much about which studio runs the best campaigns as about actual quality. Also, who in the voting academy actually watches the show. I’m mostly surprised TNT managed to work up that much of an effort! What makes “From Time to Time” so grrr-inducing is that it is based on a SMASHING series of kid books by L.M. Boston, the “Green Knowe” series, and the movie was so awful, in spite of great source material, and a wonderful cast. 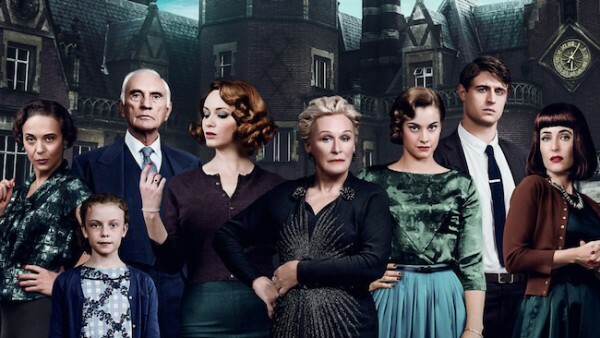 I blame Julian Fellowes. 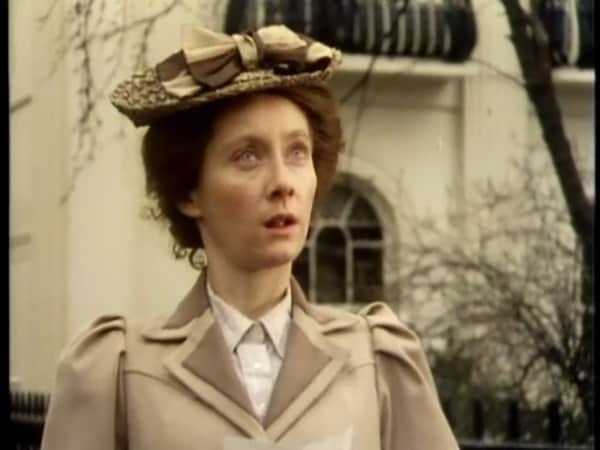 I did love The Duchess of Duke Street back in the day — I actually watched it as a kid IN REAL TIME when it aired on PBS. 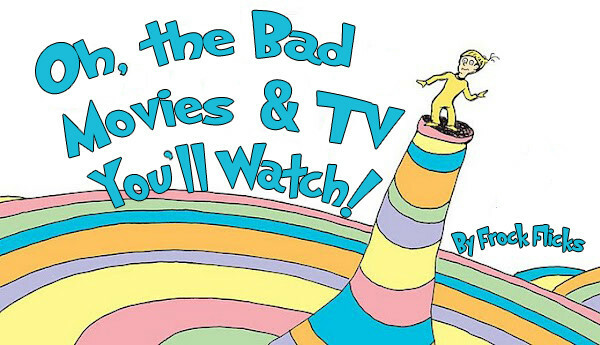 (My mom would let me stay up late once a week just so we could watch it together as this was before the advent of VHS. Much to the chagrin of my father). I do own the DVD reissue but haven’t watched it and now I’m afraid it won’t hold up to my fond childhood memories. Alas! The Woman in Gold was pretty interesting, having read the book, though I thought Ryan Reynolds was oddly cast. If you ever get to NYC I highly recommend going to the Neue Gallerie to see the original painting — it’s a small gallery and fairly expensive, but it’s really worth seeing. It is just stunning in real life. Try the British drama series Lilies (2007)! Just after WWI, working class Liverpool, three sisters. From Time to Time sounds like a bad knock-off of a rather sweet children’s book called A Traveller in Time, first published in the 1930s. It’s about a little girl who goes to stay with family in the country, and learns that Mary Queen of Scotts was once held prisoner in the nearby ruins. She travels back in time, tries to get involved in a plot to help Mary escape, but history can’t be changed, etc. etc. I’m REALLY excited to watch The Terror.